═══════════════════════════════ C huck Mondrus - Temple Ahavat Shalom, Northridge, CA. “To Rabbis Druin, Shawna, and Lutz, This project has brought our community together in an amazing way. THANK YOU, THANK YOU, THANK YOU!! !” _________________ Sheila Reback - Temple Ahavat Shalom, Northridge, CA. “The Torah Restoration Project has been one of life's highlights, and thank you for sharing and contributing to its success. And to my wonderful co-workers and clergy, it has been quite a journey. My deepest thanks for the privilege and honor of serving on this committee.” _________________ Frances Lapides - Temple Ahavat Shalom, Northridge, CA. “My husband and I chaired the Torah Writing committee and I must say it was one of the most fulfilling volunteer jobs we have ever done. Rabbi Druin was the easiest person to work with. He put up with all our mishagash and always was so accommodating. The experience he gave each and every signer was so inspiring. Most people came out of the sanctuary in tears at the way he had connected to each and everyone. He seems to have a special sense as to what people need and are looking for to make them feel fulfilled. Watching him with our children was so amazing. When he met with the preschool, I was told they only can really pay attention to one thing for 20 minutes. After 40 minutes while he still had the kids enthralled we had to interupt as we had people waiting to write in the torah. The experience also provided me a chance to really get to know our congregation as I spoke with everyone who signed to set up their appointment and was time consuming it was also so rewarding - not one person called to complain - everyone was so grateful for the opportunity to write a letter in the torah. The materials and suggestions of Sofer On Site were also a great help as we set up the experience that our congregants would have. We thank you so much for the opportunity to work with you and would be glad to talk with anyone who is considering working with you to tell about our wonderful experience. ═══════════════════════════════ L ouise Zirretta - Past President - Har Sinai Congregation - Owings Mills, MD Our Torah Restoration project was completed during my term as President and under our Interim Rabbi Darryl Crystal. It was an extraordinary experience, and one that created wonderful community and pride. We are forever pleased with all that Sofer On Site did to make that holy undertaking so special! L'Shalom ═══════════════════════════════ J oanna Nevins - Congregation B’nai Yisrael - Armonk, NY I just wanted to say, Thank you to Rabbi Yochanan Salazar for such an amazing visit this past Thursday. Our students had such a wonderful time. Parents emailed us over the weekend to say that their child was still talking about the Sofer! Rabbi Salazar was great with our young people. He really was patient and responsive to all their questions. B'Shalom ═══════════════════════════════ N eil Katz - Chizuk Amuno Congregation, Baltimore MD. Very well organized and a pleasure to work with over the past year. They made the experience for our members extra special. ═══════════════════════════════ J onathan Burstein - Temple Aliya - Woodland Hills, CA Sofer On Site made our Torah writing experience something special, the Rabbi had something special to say to each individual writing a letter. I could not believe the passion and joy which they injected into our Torah....they were simply put...the BEST. ═══════════════════════════════ C antor Elizabeth Shammash - Tiferet Bet Israel, Blue Bell, PA Thank YOU, Rabbi Druin, Sunday morning was just beautiful for us ,and the joy continued to the evening when we had a wonderful concert and made a Shehechiyanu. Thank you for all of your travel, teaching, energy and effort in helping us with this amazing project. I got a glimpse into the scroll , and the calligraphy is so beautiful and so clear; it is going to be JOY to read from, light to carry, and will really be a help to the Bnai Mitzvah who sometimes have trouble when the calligraphy is to fancy or words too tight together. It will be a great gift to this congregation forever. Toda Raba!! ═══════════════════════════════ R abbi David Rosen - Beth Yeshurun, Houston TX. One of the most surprising parts of the Torah Project has been the stream of people who have come to me after scribing their letters, and have told me (often through tear-filled eyes) how moved they were by the experience. Over and over, I have been told by men and women alike that scribing their letter was one of the most moving spiritual experiences of their lives. Even people I know who rarely show emotion have expressed the emotional impact of the Torah scribing experience. Clearly, writing a Torah has proven to be more than any of us imagined: It's not just the physical experience itself, but something much deeper, and what excites me is knowing there are still hundreds of families who have not yet had the experience but have something waiting for them that will surprise, delight and touch them in ways they cannot begin to understand! Working with Rabbi Druin and his associates was a wonderful experience. Rabbi Druin was always available for counsel and advice. On those days when we had congregants come to scribe letters in our new Torah, everyone had nothing but praise for Rabbi Druin and his fellow scribes. The rabbis' abilities to talk about each congregant's letter made everyone feel closer to the text and had the power to touch each person and each family emotionally. All in all, writing our Torah was a very positive experience for our congregation and I was very pleased that we chose Sofer On Site. ═══════════════════════════════ A my Mook - Bet Shira, House of Song, Port Townsend, WA Shalom Rabbi Druin, I so appreciate your reply to me, it means a lot that you care about my love of my Torah...I want you to know that your integrity and work were unquestioned, and I have so much respect for your level of expertise and more than that for your love of Torah. I know you sacrifice a lot to travel the way you do repairing the sacred Torahs. And so, now that I understand what I probably should have understood already, what the real costs of having my Torah repaired are, I am pleased to send you your hard earned fee for the amazing work you have done on my beloved Torah. And thank you to your staff who are so respectful and respond so quickly to all questions and concerns. ═══════════════════════════════ J an Catalfumo - Executive Director - Temple Beth El of Boca Raton, FL Today, we came together as a community to celebrate the fulfillment of the 613th commandment – to scribe a Torah in our lifetime. The power of this accomplishment was evident as each segment of the program unfolded... There were so many inspired people who helped to make this project relevant to all congregants at all levels of involvement in our community...Joyful members and guests left the Temple today with great pride in their Jewish heritage. From generation to generation, we will continue to inspire our members by reading from a Torah that we helped to write. We will remember unfolding the Torah, writing letters together, blessing and reading from the Torah, dressing the Torah, and bringing the Torah under the wimple to its new home. _________________ David Oney - Torah Project Coordinator - Temple Beth El, Boca Raton FL. Spending a year scheduling and organizing letter scribing events, creating new communication tools , and designing marketing materials to support our amazing Torah Project committee as we wrote a new Torah with Sofer On Site for Temple Beth El of Boca Raton truly was a once in a lifetime mitzvah. Our participants immensely enjoyed the opportunity to scribe a letter and Rabbi Bialo who enhanced the experience with his knowledge, warmth, humor and obvious love of both being a sofer and of Torah. I personally worked mostly behind the scenes often with the very talented Rabbi Shmuel Goldstein. With patience and willingness to compromise, to accommodate new ideas, and to make untold revisions, often under unreasonable deadlines, Rabbi Goldstein was generous in explaining the why’s and how’s of his vision thereby enhancing my skills in the art of design. Definitely a “bucket list” endeavor. ═══════════════════════════════ Stuart Leeman - Congregation Kol Tikvah - Parkland, FL We used Sofer On Site and had a great experience from planning until the final celebration. A success in every sense of the word. ═══════════════════════════════ M ike Edison - President - Congregation B'nai Israel of Fayetteville, GA On behalf of Congregation B'nai Israel of Fayetteville, GA, I would like to thank Rabbi Salazar for your work here, and for restoring our Holocaust Torah to proper condition. I would especially like to thank you for conducting those two informational classes during the day...Those who attended your classes were very impressed with your skill and knowledge. Thank you once again. ═══════════════════════════════ D ebra Antzis - Project Chair Head - Temple Shalom, Naples, FL. Hi, Rabbi Goldstein, I just wanted to thank you again, I love the logo. Susan and Mark found it a pleasure to work with you, and look forward to more collaboration going forward. _________________ Susan Freeman & Marc Simon - Marketing - Temple Shalom, Naples, FL. The (pleasurable) feeling (of working together with you) is mutual! We so enjoyed working with you and you did a beautiful job! We just want you to know that we love it (the logo) too, as does the whole Marketing Committee. We look forward to working together again as this project moves forward. Thank you very much. Torah is the prized inheritance of the Jewish people. It moves, motivates, and unites us as a nation. For 3,000 years we have learned to live our lives through the teachings, guidance and message of Torah. We search for new ways to bring ourselves closer to it. At Sofer On Site, we are honored to provide beautiful STa’M of the highest Halachic standards, while bringing Torah’s timeless messages to you, and inspire generations to come. Testimonials Personal feedback on Sofer On Site’ s projects and services. ═══════════════════════════════ C huck Mondrus - Temple Ahavat Shalom, Northridge, CA. “To Rabbis Druin, Shawna, and Lutz, This project has brought our community together in an amazing way. THANK YOU, THANK YOU, THANK YOU!! !” _________________ Sheila Reback - Temple Ahavat Shalom, Northridge, CA. “The Torah Restoration Project has been one of life's highlights, and thank you for sharing and contributing to its success. And to my wonderful co-workers and clergy, it has been quite a journey. My deepest thanks for the privilege and honor of serving on this committee.” _________________ Frances Lapides - Temple Ahavat Shalom, Northridge, CA. “My husband and I chaired the Torah Writing committee and I must say it was one of the most fulfilling volunteer jobs we have ever done. Rabbi Druin was the easiest person to work with. He put up with all our mishagash and always was so accommodating. The experience he gave each and every signer was so inspiring. Most people came out of the sanctuary in tears at the way he had connected to each and everyone. He seems to have a special sense as to what people need and are looking for to make them feel fulfilled. Watching him with our children was so amazing. When he met with the preschool, I was told they only can really pay attention to one thing for 20 minutes. After 40 minutes while he still had the kids enthralled we had to interupt as we had people waiting to write in the torah. The experience also provided me a chance to really get to know our congregation as I spoke with everyone who signed to set up their appointment and was time consuming it was also so rewarding - not one person called to complain - everyone was so grateful for the opportunity to write a letter in the torah. The materials and suggestions of Sofer On Site were also a great help as we set up the experience that our congregants would have. We thank you so much for the opportunity to work with you and would be glad to talk with anyone who is considering working with you to tell about our wonderful experience. ═══════════════════════════════ L ouise Zirretta - Past President - Har Sinai Congregation - Owings Mills, MD Our Torah Restoration project was completed during my term as President and under our Interim Rabbi Darryl Crystal. It was an extraordinary experience, and one that created wonderful community and pride. We are forever pleased with all that Sofer On Site did to make that holy undertaking so special! L'Shalom ═══════════════════════════════ J oanna Nevins - Congregation B’nai Yisrael - Armonk, NY I just wanted to say, Thank you to Rabbi Yochanan Salazar for such an amazing visit this past Thursday. Our students had such a wonderful time. Parents emailed us over the weekend to say that their child was still talking about the Sofer! Rabbi Salazar was great with our young people. He really was patient and responsive to all their questions. B'Shalom ═══════════════════════════════ N eil Katz - Chizuk Amuno Congregation, Baltimore MD. Very well organized and a pleasure to work with over the past year. They made the experience for our members extra special. ═══════════════════════════════ J onathan Burstein - Temple Aliya - Woodland Hills, CA Sofer On Site made our Torah writing experience something special, the Rabbi had something special to say to each individual writing a letter. I could not believe the passion and joy which they injected into our Torah....they were simply put...the BEST. ═══════════════════════════════ C antor Elizabeth Shammash - Tiferet Bet Israel, Blue Bell, PA Thank YOU, Rabbi Druin, Sunday morning was just beautiful for us ,and the joy continued to the evening when we had a wonderful concert and made a Shehechiyanu. Thank you for all of your travel, teaching, energy and effort in helping us with this amazing project. I got a glimpse into the scroll , and the calligraphy is so beautiful and so clear; it is going to be JOY to read from, light to carry, and will really be a help to the Bnai Mitzvah who sometimes have trouble when the calligraphy is to fancy or words too tight together. It will be a great gift to this congregation forever. Toda Raba!! ═══════════════════════════════ R abbi David Rosen - Beth Yeshurun, Houston TX. One of the most surprising parts of the Torah Project has been the stream of people who have come to me after scribing their letters, and have told me (often through tear- filled eyes) how moved they were by the experience. Over and over, I have been told by men and women alike that scribing their letter was one of the most moving spiritual experiences of their lives. Even people I know who rarely show emotion have expressed the emotional impact of the Torah scribing experience. Clearly, writing a Torah has proven to be more than any of us imagined: It's not just the physical experience itself, but something much deeper, and what excites me is knowing there are still hundreds of families who have not yet had the experience but have something waiting for them that will surprise, delight and touch them in ways they cannot begin to understand! Working with Rabbi Druin and his associates was a wonderful experience. Rabbi Druin was always available for counsel and advice. On those days when we had congregants come to scribe letters in our new Torah, everyone had nothing but praise for Rabbi Druin and his fellow scribes. The rabbis' abilities to talk about each congregant's letter made everyone feel closer to the text and had the power to touch each person and each family emotionally. 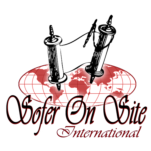 All in all, writing our Torah was a very positive experience for our congregation and I was very pleased that we chose Sofer On Site. ═══════════════════════════════ A my Mook - Bet Shira, House of Song, Port Townsend, WA Shalom Rabbi Druin, I so appreciate your reply to me, it means a lot that you care about my love of my Torah...I want you to know that your integrity and work were unquestioned, and I have so much respect for your level of expertise and more than that for your love of Torah. I know you sacrifice a lot to travel the way you do repairing the sacred Torahs. And so, now that I understand what I probably should have understood already, what the real costs of having my Torah repaired are, I am pleased to send you your hard earned fee for the amazing work you have done on my beloved Torah. And thank you to your staff who are so respectful and respond so quickly to all questions and concerns. ═══════════════════════════════ J an Catalfumo - Executive Director - Temple Beth El of Boca Raton, FL Today, we came together as a community to celebrate the fulfillment of the 613th commandment – to scribe a Torah in our lifetime. The power of this accomplishment was evident as each segment of the program unfolded... There were so many inspired people who helped to make this project relevant to all congregants at all levels of involvement in our community...Joyful members and guests left the Temple today with great pride in their Jewish heritage. From generation to generation, we will continue to inspire our members by reading from a Torah that we helped to write. We will remember unfolding the Torah, writing letters together, blessing and reading from the Torah, dressing the Torah, and bringing the Torah under the wimple to its new home. _________________ David Oney - Torah Project Coordinator - Temple Beth El, Boca Raton FL. Spending a year scheduling and organizing letter scribing events, creating new communication tools , and designing marketing materials to support our amazing Torah Project committee as we wrote a new Torah with Sofer On Site for Temple Beth El of Boca Raton truly was a once in a lifetime mitzvah. Our participants immensely enjoyed the opportunity to scribe a letter and Rabbi Bialo who enhanced the experience with his knowledge, warmth, humor and obvious love of both being a sofer and of Torah. I personally worked mostly behind the scenes often with the very talented Rabbi Shmuel Goldstein. With patience and willingness to compromise, to accommodate new ideas, and to make untold revisions, often under unreasonable deadlines, Rabbi Goldstein was generous in explaining the why’s and how’s of his vision thereby enhancing my skills in the art of design. Definitely a “bucket list” endeavor. ═══════════════════════════════ Stuart Leeman - Congregation Kol Tikvah - Parkland, FL We used Sofer On Site and had a great experience from planning until the final celebration. A success in every sense of the word. ═══════════════════════════════ M ike Edison - President - Congregation B'nai Israel of Fayetteville, GA On behalf of Congregation B'nai Israel of Fayetteville, GA, I would like to thank Rabbi Salazar for your work here, and for restoring our Holocaust Torah to proper condition. I would especially like to thank you for conducting those two informational classes during the day...Those who attended your classes were very impressed with your skill and knowledge. Thank you once again. ═══════════════════════════════ D ebra Antzis - Project Chair Head - Temple Shalom, Naples, FL. Hi, Rabbi Goldstein, I just wanted to thank you again, I love the logo. Susan and Mark found it a pleasure to work with you, and look forward to more collaboration going forward. _________________ Susan Freeman & Marc Simon - Marketing - Temple Shalom, Naples, FL. The (pleasurable) feeling (of working together with you) is mutual! We so enjoyed working with you and you did a beautiful job! We just want you to know that we love it (the logo) too, as does the whole Marketing Committee. We look forward to working together again as this project moves forward. Thank you very much.